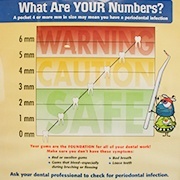 Periodontal disease (also known as gum disease) is one of the most common oral health problems patients experience over the course of their lives. While this condition can seem relatively painless at first and even go unnoticed altogether, advanced stages can result in the loss of teeth and other previously healthy bone structure. At Dental & Cosmetic Solutions, our team provides top-tier diagnostic services for gum disease, as well as therapy options that can cleanse the infected areas and restore health to the patient’s smile. Scaling & root planing is an in-depth cleaning that can help remove bacteria and plaque accumulations from hard-to-reach areas of the mouth. The first portion of the treatment (the “scaling”) involves a thorough review around and underneath the gum tissue. 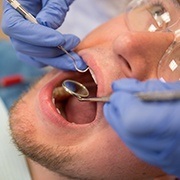 Then, during the “root planing” portion, we will go to work on carefully and gently smoothing any rough surfaces on the tooth roots, which can be magnets for plaque. When needed, we can also use our revolutionary soft tissue laser to treat and eliminate diseased tissue from the patient’s mouth in order to curb the development of gum disease. Unlike traditional scalpels, this technology is safer, much more precise, and more comfortable for patients. Post-operative symptoms like bleeding and swelling are greatly minimized, and the recovery process is accelerated as well. 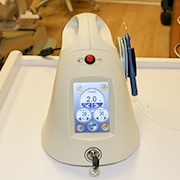 The use of the laser can even encourage the growth of new, healthy tissue! 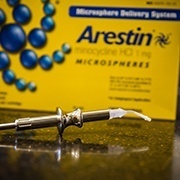 ARESTIN is an antimicrobial agent that is applied directly to periodontal pockets after cleaning procedures. Over the next several hours or so, it will provide a strong dose of antibiotic to the site and work to eliminate any remaining harmful bacteria. This technique is especially effective at reaching bacteria that are well-hidden at the bottom of pockets.